In addition to doing my patch prep right now, I'm trying to complete the landscaping for the backyard. Then very soon I'll be doing the greenhouse. Three big projects in a two month period. Not ideal. But I pretty much have to get it all done. This website allows you to pick points for the corners of the area and it then figures out the square footage. You can do multiple areas which it will then total. So you can easily look at the satellite view of your pumpkin patch. 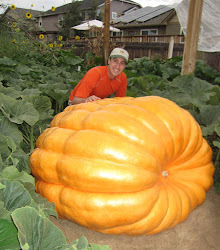 Pick the corners of the patch and within about 1/2 foot have an accurate measurement for the pumpkin patch or any other area of any size. Pretty cool.